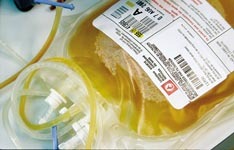 Plasma is the straw-colored fluid in which blood cells are suspended. It makes up about 55% of blood by volume and is composed of approximately 92% water, 6–8% serum proteins, 0.8% salts, 0.6% lipids, and 0.1% glucose (blood sugar). Plasma transports materials needed by cells and materials that must be removed from cells, including various ions (Na+, Ca2+, HCO3-, etc), glucose and traces of other sugars, amino acids, other organic acids, cholesterol and other lipids, hormones, and urea and other wastes.